Hurricane Katrina destroyed two New Orleans-based warehouses owned by Transportation Consultants, Inc. (TCI). What the family-run company needed was a good turn of luck, and that's just what they got when they found vacant land for a new facility at the Port of New Orleans. This spot would also serve as a perfect platform for them to enter the Form-Fill-Seal packaging market, a natural extension of their warehouse and shipping services, and help boost the local economy by creating 60 local jobs. Christian Jensen, President of TCI, said, "There was a 27-acre tract available at the Port of New Orleans that opened tremendous opportunities for us as a company and would also benefit the community. We teamed up with the State of Louisiana and local agencies to raise the capital to build a 150,000 ft2 facility, which would serve as our warehouse, packaging plant and headquarters. ?He added that the new facility is connected to the 6 Class-1 railroads in North America through the New Orleans Public Belt Railroad." TCI recently installed a TOPAS FFS line from W&H and is the first company in North America to bag PVC powder with fully-automated FFS equipment. While the FFS process is tried and true for the packaging of pellets, it has proven tricky for some powdery chemicals with dust particles that prevent reliable sealing. W&H designed the TOPAS at TCI to bypass this problem by deterring dust from entering the seal area. This is done by mechanically obstructing dust during filling and afterward blowing ionized air to eliminate any particles that might have collected. What is the benefit to packaging PVC powder with FFS machinery? Jensen answers,"That's what's so exciting. It's much faster and cheaper than alternative packaging styles, and the package itself is recyclable." The packaging process at TCI is very convenient. Rail cars can park on two spurs located alongside TCI's facility. A pneumatic conveyer pulls resins or PVC powder into a silo over the net weighing system just above the TOPAS. After packaging, the goods are palletized and ready for transport by truck or ship. The Port and TCI have an overweight cargo permit which allows for shipments of up to 5,600 lbs. per container to leave from New Orleans for international destinations. Jensen comments, "When calculating export booking costs, New Orleans saves the resin industry approximately 15% on ocean bill-of-lading costs. ?Shipments are sent all over the world, although traffic to Latin America and the Caribbean is currently very strong." TCI was founded in 1983 by CEO, Jack Jensen Jr., who recognized the need for trucking and warehousing in New Orleans. What began as a one-truck shop has evolved into a company with five US locations, three Central American offices, that dispatches more than 500 trucks per day. (New Orleans, La.) In a move that will foster widespread transformation of commerce along New Orleans' Industrial Canal, the Board of Commissioners for the Port of New Orleans, today, adopted a resolution allowing the Port to enter into a 15-year lease agreement with Transportation Consultants, Inc. (TCI) for the lease of the Governor Nicholls Street Wharf. The groundbreaking decision releases TCI, a full service logistics provider with operations in New Orleans (headquarters), Houston, Dallas, and Baltimore, to advance one of four forthcoming expansion projects along the Industrial Canal, which experienced a serious decline in port commerce following Hurricane Katrina. Overall, TCI is poised to engage several new and expanded commercial projects and approximately $20.5 million in infrastructural investments that will increase value added services to commodity specific markets, warehouse packaging and intermodal logistics. TCI will share expansion plans Friday, September 23, 2011, during an open house at its new and fully operational national headquarters and packaging facility, 3900 France Road Parkway in New Orleans from 6:30PM to 10:00PM. TCI Founder & CEO Jack Jensen said, "Four years ago, the TCI Family set forth an ambitious plan to enhance our current operations and expand the value added market industry along the Industrial Canal in New Orleans. Today's announcement is indicative of our unwavering focus and commitment to bring new port commerce to the city and Louisiana." The recent and future activities are the pinnacle of a three-phase project, which started with TCI's procurement of 27 acres of undeveloped, unimproved property from the Port of New Orleans in 2008. During that transaction, TCI invested $10 million to secure the acreage, a container cargo handling facility and a 150,000 square foot facility for warehousing and TCI's national headquarters. By the end of 2011, the initial investment will have resulted in approximately 60 direct jobs in addition to increased port activity and revenue, which is the result of more than 10,000 twenty foot equivalent units (TEU) transitioning from outside ports to the Port of New Orleans annually. Likewise, the expansions will provide an additional 20 direct jobs and is projected to produce more than 300 indirect industry related jobs. These indirect jobs include freight-forwarders, stevedores, rail operators, potential barge/vessel crews, customs and a host of supply-chain forwarding vendors and providers. TEU volume is also expected to triple once France Road Parkway Properties, II L.L.C. constructs a 150,000 square foot warehouse packaging facility for TCI to lease. The capacity of the additional facility will result in more than 30,000 TEUs imported to New Orleans annually by the year 2013. That is equivalent to approximately $25.3 million of new port revenue. TCI President Christian Jensen said, "This expansion project will leverage TCI's operational capacity and efficiency with new systems and technologies, while creating an environment that is ripe with sustainable job opportunities and economic development." Negotiate with the Port of New Orleans for the sale of additional land on Alvar Street. Project specific details will be disclosed during the open house. France Road Parkway Properties will begin building a150,000-square-foot world-class corporate office and warehouse facility for New Orleans-based Transportation Consultants, Inc. As a result of the long-term lease agreement between France Road Parkway Properties and TCI, TCI will move its corporate headquarters to the New Orleans site upon completion ofconstruction. This private investment will assist the Port of New Orleans in building the necessary logistical infrastructure to retain and attract new international trade opportunities. The project consists of approximately 27 undeveloped acres between France Road Parkway and Alvar Street, which is located west of the Industrial Canal. Groundbreaking will occur at the end of September and the construction is expected to be completed in June of 2010. The project is expected to retain and create approximately 150 jobs in New Orleans in the next three years. "This investment shows our strong commitment to the City and our confidence in the local and regional economy," said TCI's Founder and CEO Jack Jensen. Christian Jensen, the company's President, said the facility will allow TCI to service its current demand and future strategic plans at the Port of New Orleans. "The on-site access to 6 class-1 rail services provided by the New Orleans Public Belt Railroad and immediate proximity to the Port of New Orleans will allow us to efficiently and cost-effectively move cargo for our customers," Jensen said. “This facility will greatly assist with our efforts to attract new cargo and commodities to New Orleans, especially with the timing of the implementation of the new Cargo Tax Credit program,” he added. "Without a doubt, in this economy this is one of the more exciting and real private economic development projects in New Orleans," said legal counsel for Transportation Consultants, Inc. and attorney from Adams and Reese LLP. The financing of the construction of the project, which is being completed by IBERIABANK, is nearing finalization and includes GO Zone bond financing, which was approved by the New Orleans Industrial Development Board and Louisiana State Bond Commission earlier this year. The GO Zone bonds will be leveraged by new market tax credits. In addition to its cargo handling and cruise facilities, the Board of Commissioners of the Port of New Orleans traditionally has leased industrial property located near the Inner Harbor Navigational Canal. Recently, it has received many requests from existing or prospective tenants to purchase tracts of industrial properties in this area. In order to take advantage of financing opportunities, sometimes the investor has to own the property. The board has said that it will evaluate these transactions on a case by case basis, and decide whether they are in the long term interest of the New Orleans port community. TCI Adds 15 New Trucks in New OrleansNEW ORLEANS, Louisiana—9 January 2009—Transportation Consultants, Inc. (TCI) has entered into a contract with Southland Idealease for 15 new 2009 Kenworth trucks. The new trucks are to be added to TCI’s New Orleans truck fleet through February of this year and used for hauling shipping containers to and from ports, railroads, manufacturers and warehouses across the U.S. Gulf South by Transportation Worker Identification Credential (TWIC) certified drivers. The additional trucks will allow TCI to handle a greater volume of containers and at better fuel efficiencies. In fact, the new model of truck to be used by TCI has been acknowledged by the Environmental Protection Agency as SmartWay-eligible meaning that it produces significantly lower emissions and requires less fuel consumption than other similar truck models. According to Bureau of Transportation Statistics 2006 data, the average combination truck, which includes the type of freight trucks used by TCI, operates at 5.1 miles per gallon. In comparison, each of TCI’s new 2009 Kenworth trucks gets at least 7 miles per gallon, which is expected to generate an annual total cost savings of $190,000 for the company and spare over 63,000 gallons of fuel annually. In addition to the new trucks, TCI signed a letter of intent in November 2008 to purchase and operate a new 28-acre container depot and warehouse facility in New Orleans East between France Road Parkway and Alvar Street west of the Industrial Canal. TCI is an international trucking and warehousing company that specializes in containerized cargo. TCI operates a fleet of over 250 trucks with locations in Baltimore, Dallas, Houston, Mobile, and New Orleans. All TCI drivers are TWIC compliant. For additional, useful information about TCI visit www.tcitrucking.com. NEW ORLEANS, Louisiana—4 September 2008— All Transportation Consultants, Inc. (TCI) Gulf South terminals are open for business and fully operational after Hurricane Gustav made landfall in Southern Louisiana on Monday morning, September 1. TCI's storm preparations in New Orleans began approximately one week before Gustav reached Louisiana and included in-gating into the Port, or securing all empty and loaded shipping containers. TCI's Container Yard in Mobile, Alabama was also emptied of all equipment and secured in preparation of possible severe weather from the Hurricane. "TCI's preparations for Gustav started before the Storm even entered the Gulf," said Christian Jensen, President of TCI, headquartered in New Orleans. "We are pleased to announce to customers seeking comprehensive trucking and warehousing services that all TCI terminals, including Gulf South offices, are open for business and in full working order." TCI is an international trucking and warehousing company that specializes in containerized cargo. TCI operates a fleet of over 250 trucks and locations in Baltimore, Dallas, Houston, Mobile, and New Orleans. For additional, useful information about TCI visit http://www.tcitrucking.com. DALLAS, TX–New Orleans based Transportation Consultants, Inc. (TCI Trucking & Warehousing) opened a new, full service warehouse in Dallas. The new facility spans 10,000 sq. ft. and is located on Halifax Street approximately 7 miles from the Dallas Love Field Airport. Specific capabilities include cross docking, transloading, and short-term storage for break-bulk and palletized cargo. Mitch Fussell, Terminal Manager, TCI Dallas, commented, “In addition to the cross dock facility, we [TCI Dallas] operate a 4-acre container depot and have a fleet of over 50 trucks serving the Dallas/Fort Worth area. We are in a unique position to provide customers with a one-stop shop for logistical services, saving our customers time and money.” Customers are urged to contact Mitch by phone at (214) 428-0560 to learn more about TCI Dallas, the new cross dock facility, and other services offered. For additional information about TCI visit www.tcitrucking.com. Article written by: Nick Bousquet. MOBILE COUNTY, Alabama - On Tuesday, February 19, New Orleans, LA-based Transportation Consultants, Inc. (TCI Trucking & Warehousing) opened a new container yard in Mobile County to provide better service to customers requiring trucking to and from the Port of Mobile. The new TCI yard spans 8 acres in Prichard on Conception Street, and is located approximately 1 mile from the Port. TCI’s Mobile trucking operations and container yard are to be managed by Mr. Christian Howard, who has over 15 years of experience in intermodal transportation and container yard management. Mr. Howard commented, “We [TCI Mobile] are standing by to offer a wide-range of services in the Mobile-area, including container drayage and storage, as well as commodity and logistics consulting.” Customers are urged to contact Mr. Howard at (251) 545-4398 or by e-mail to learn more about TCI Mobile, the new container yard, and services offered. 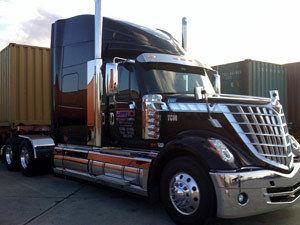 In December 2007, TCI expanded its fleet to 250 trucks after adding a terminal in Fort Worth, TX. TCI currently has locations in Baltimore, Dallas, Fort Worth, Houston, Mobile, and New Orleans. For additional, useful information about TCI visit www.tcitrucking.com. TCI adds 130,000 sf of warehousing space in Houston, TX. TCI adds 55 trucks to its Houston/Dallas lane. TCI Launches Website in Spanish September 5, 2007. TCI has launched its website in Spanish on September 5, 2007. TCI Trucking is pleased to announce the launch of its new website to the general public. TCI launches its Customer Interface Server. Current customers can email for login details.